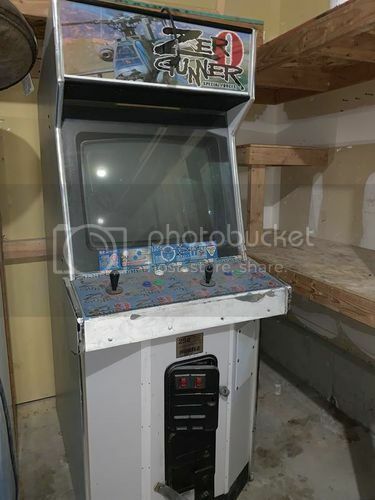 Hey all - I bought my very first full arcade cabinet a few weeks ago, an old Virtua Fighter 1 cab that was converted to a helicopter schmup called Zero Gunner. The Zero Gunner board is running fine, and the monitor is good, just needs a cap kit. I've always wanted a full-on MAME cab, and I'm considering doing that with this one. Thoughts? My concern is this cab is a beast--it's really large and really heavy. Trying to get it down my narrow basement stairs would be tough. That said, I'm thinking about setting up a large shed in the backyard in the near future, and my wife is willing to let me turn 2/3 of it into a game room, so that might not be an issue. The CP is pretty large and I could make a pretty decent franken-panel out of it. A nice bonus is that the cab still has the original Virtua Fighter board inside. So the other option is (if the VF board is working), to set it up as a Virtua Fighter, repair/clean it up and put some new art on it, then sell it to make some $$$ for collecting a few other cabs. Would that be worth it? I was never a big Virtua Fighter fan, so I have no idea how popular it is with collectors. I've found a few marquees for sale, and even a bezel--but the side art and CPO seem non-existent. Would appreciate any input. Excited about getting more into this hobby! Virtua Fighters go for around $3-$400. No idea how much Zero Gunner is going for. Not a lot of $$$ for the effort. Nothing you have here would be all that great for collectors. What I suggest is either sell the whole set up and get a more manageable sized empty cab off of craigslist for cheap, or part out the VF 1 board the zero gunner board, the marquee etc. Get those parts to the guys out there trying to restore other machines. Mame the empty cab (I know there are a ton out there.) and enjoy the process. And a little bit of advice, if you want to get into restorations... my experience is this. Restore cabs that are dedicated and old school. Those are the ones that sell. Nintendo, Universal, Midway, Namco, old school 80's cabs. Galaxian, Galaga... etc. This is just the kind of info I was looking for - much appreciated! I will probably part it out as you suggested, that makes the most sense. One question for the MAME-ing process--is it feasible to cut down the back of an existing cab to turn it into a more "slimline" cab? I thought about that as a possibility for keeping this big guy, but I wonder if it would be more trouble than it's worth. Appreciate the advice about the 80s cabs. I'm actually hoping to get an original Afterburner this weekend, if the sale goes through. I would love to get some more vintage stuff to work on, but so far haven't found anything else in my price range. I'll buy that Zero Gunner board from you, if you're going to part it out. PM sent. I haven't read many project logs where someone has tackled this successfully. The only project that comes to mind is the Ground Kontrol X-men cab, but even they decided to rebuild the cabinet from scratch with slim dimensions. With the amount of work involved, chopping it down wouldn't be a short-cut, and you would have to remove the CRT, which I wouldn't do if it's in good working order. Good condition Arcade CRT's are getting rarer these days. Regarding the CRT and cutting the cab, I think the longer you get into the hobby, the more you are going to appreciate the old school glow and response time of these monitors. So even if you don't think you'll need the CRT look now, you might in the future. You can convert a cab to mame that is easily 100% reversible if done right. Keep the arcade crt. It’s a gem. Shaders can’t replicate it accurately. You will regret ditching it. It's most likely a medium res monitor.... lots of those around. And that can not be mame'd easily with an arcade vga card. Sell it to someone who needs it. Appreciate the advice guys. I've since picked up a few other cabs (After Burner and Elevator Action) that I want to restore. I'll probably sell the parts and MAME this cab up--will see how it goes. Thanks!